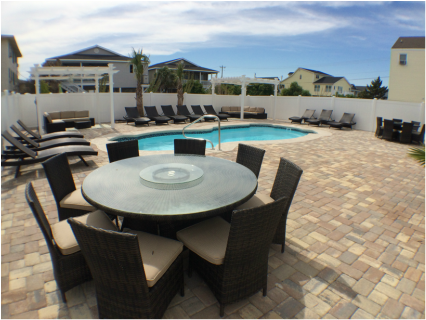 The Atlantic Chill is a fully renovated luxury home located just steps from the Atlantic Ocean. A unique duplex property featuring two units that can be combined and used together or rented individually. In the upstairs unit you will find all of the comforts of home; modern furnishings with an intentional rustic coastal feel, gourmet kitchen with granite counter tops, fully tiled bathrooms and Carrara marble accents. Both units have private front and back entries; the units adjoin with an interior staircase that can be locked off for individual use. Guests will enjoy a huge 30 X 16 pool and resort style outdoor furnishings, complete with loungers, sectional couches, and dining sets. Cool to the touch patio pavers cover the expansive pool surround. Covered decks on the front and back of the property also allow for enjoying the ocean breeze. Gourmet Kitchen Aid gas grill and outdoor shower complete the outdoor amenities. Custom bunk bed and built in day beds; perfect for children. Adjoining bathroom with shower and tub. Satellite television programming and flat screen tv's in all bedrooms.